Hi :) your broom and dustpan are wonderful. They are both very pretty. Monísimo!! Feliz fin de semana!! Wonderful work. They look so nice! Oh, nicely done Patty! love the artwork on them too!! Que bonito, así con esa preciosa escoba, no dará pereza barrer. Hello Patty, lovely pan and broom. Great job! I love the lovely set. Great idea and wonderful job! Your gift wis very nice. I love the lacked black paint with the decoration painting. Well done. I also admire your skills, when you craft the babies. They look so realistic and cute. How sweet! I can just see it in a mini kitchen standing up against a wall. Beautiful idea! Thanks for stopping by... AND, the lovely comment. I'm your newest follower, I hope you'll stop by again and will follow me as well. 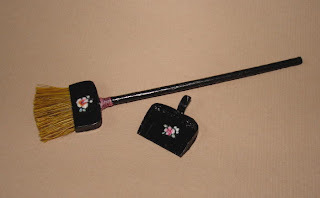 Love you little broom and dust pan...too cute. They are awfully sweet. Well done! And thank you, for your nice comment.